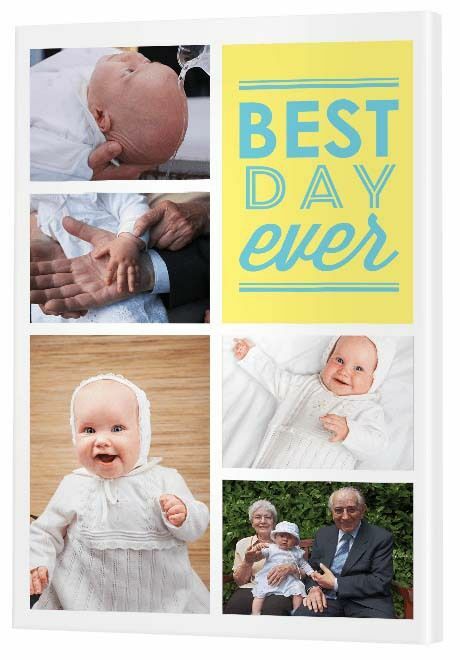 With that in mind, we've extended the love by including ideas for Christening gifts for Moms, Dads, siblings, grandparents and Godparents. 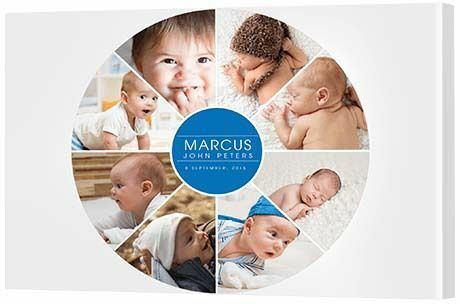 The centre circle is a perfect spot to include a personalized image where you can creatively provide his birth name and birth date. 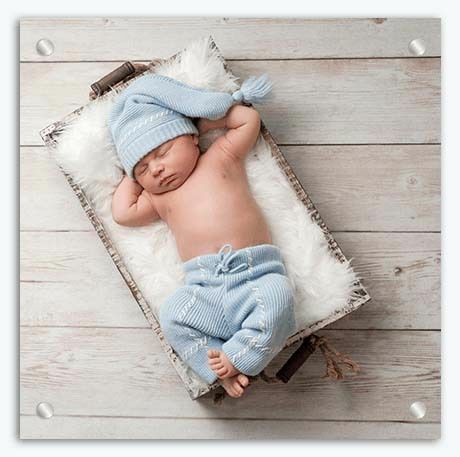 The wonderful thing about this gorgeous gift is that you simply need to stalk Mom and Dad's Facebook page to discover a treasure troves of baby photos. Not a fan of pink? Prefer to think that blue is for girls? Don't let convention stop you. This themed collage template also comes in a fun aqua color. Brushed aluminum provides oodles of personality on a good day. Add baby and you achieve greatness. Instantly arty, this silhouette collage design printed on metal screams 'cool'. Can a baby be cool? Well now she can without even learning to walk or talk yet. 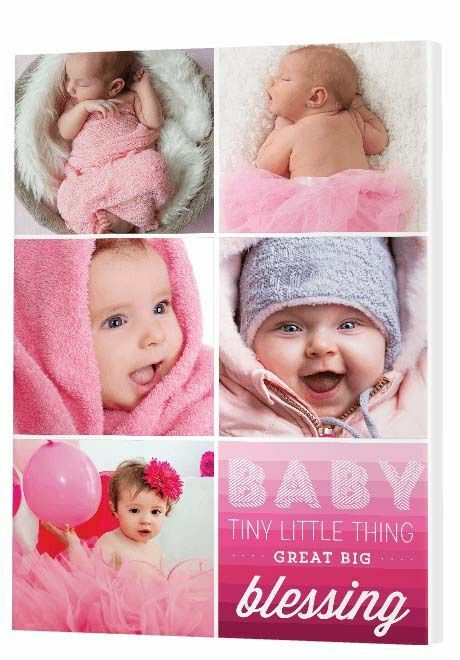 If you think 10 photos of baby is a bit too much (ridiculous notion really! 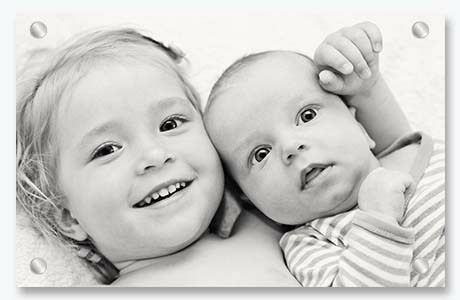 ), you may consider using some of the frames to include Mom, Dad and older brother or sister. 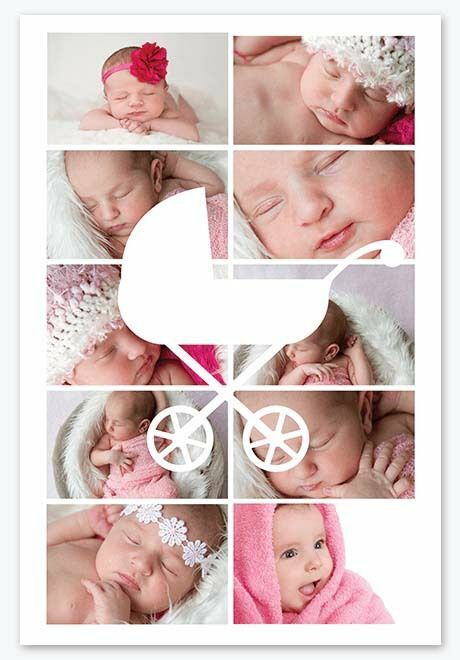 The wonderful thing about this super cute template is that you can color the wrap and the carriage. You can use the eye dropper tool in the CanvasApp to choose a color from the photos or you can pick any other color you like. Let's hear it for the Moms! 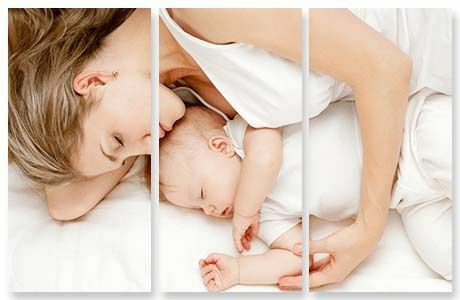 This split image canvas print is perfect for the yummy mommy who can't bear to let go. At Canvas Factory, a full color print is the same price as a black and white print, so choosing which color to print in is a creative rather than financial decision. To achieve this look, you can photograph in color, change your photos from color to grayscale in a photo editing program on your computer or, very simply, upload your color photos into our CanvasApp and choose gray in the Effects tool. Using the Effects tool, you can change the color of each individual photo, so if you're inspired to get creative and leave one panel in color and the other two in mono, you can! 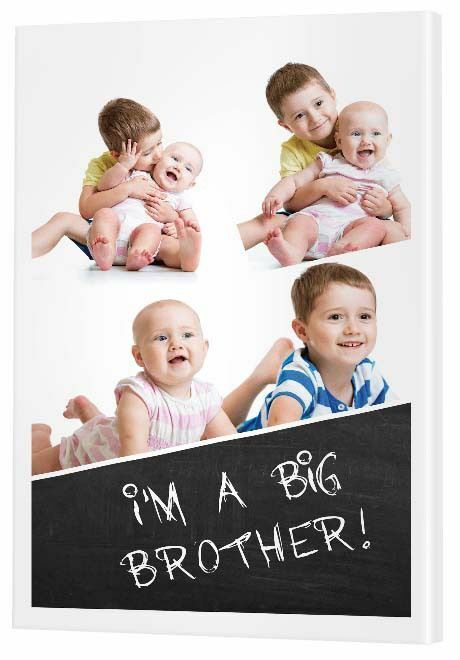 While it's important for the big brother to understand this is a day to celebrate the new baby's name, the idea of personalized christening gifts for the older sibling is all about sharing the attention and affection around. This four panel modish design has a frame at the bottom that's ideal for a personalized message. Choose a square or landscape design, but keep the text placed towards centre of the image so there's plenty of color surrounding the text. Here we've chosen to print the personalized image as white text on a black backgrond, but you can choose any color you like. Here, we've removed the color to create an arty black and white print on acrylic glass, but you can choose to use a full color photo at no extra cost. The key is to ensure your event photographer (even if it's just a family friend!) takes the time to take a photo of their newly baptized grandchild with the loving, doting grandparents. If you'd prefer to design your own customized panel of text or would like to include more photos, be sure to check out our Traditional Collage range. You can split an image across stretched canvas, acrylic glass or brushed aluminum. There are a number of different styles of split image available to choose from, so feel free to get creative.